TWO months ago I posted a survey at the bottom of the blog posing the question what is your favorite red? The list included permanent red (1% voting for it), quinacridone red (3%), alizarin crimson (34%), Indian red (2%), transparent earth red (5%), burnt sienna (20%), cadmium red light (17%), cadmium red deep (16%), and brown pink (2%). The reason I posed this question was that although I have a favorite blue (thalo blue), a favorite yellow (transparent earth yellow), as well as many others, I have yet to find a red that really thrills me like other colors of the spectrum. So my lack of passion for red remains somewhat of a mystery. Some painters refer to red as the great moderator, meaning it needs to be felt in nearly every color as a unifying presence. For the time being, I suppose I will settle for reds that are useful. Among these I count quinacridone red, transparent earth red, and cadmium red light. Some of my favorite painters use a limited palette so once, for six-months, I tried using a palette of ultramarine blue, alizarin crimson permanent, and cadmium yellow light. But with such a palette I found my paintings lacked complexity otherwise attainable by using additional hues. For me I found using a limited palette to be restrictive, and worse, it wasn't any fun. On my monthly visits to my local art store I love to linger over the paint display finally settling on a strange color. I find adding an exotic color or two boosts my creativity. I have discovered quite a few colors this way that ended up in my pantheon of must-have colors. Occasionally I pick colors in relation to other colors. For example I love andanthrone blue because it's the perfect companion color to thalo blue. I also love dioxazine purple because it compliments transparent earth yellow so well. Transparent earth yellow is also a fantastic color because it is so dark out of the tube which gives a broader range of value. I prefer some colors because of their tinting strength and purity of tone. Transparent earth red fits into that category as I find it stronger and cleaner than burnt sienna. Some colors are great because they make such wonderful grays. One such color is cadmium red light which mixes well with blues to make amazing grays. Other colors are luxuries like transparent orange which although it is a hue( meaning it is a mixture of more basic colors) it is a beautiful one and difficult to mix. It is a great substitute for Indian yellow which I find has a slight gray undertone. I have no problem using hues if it saves time and generates the kind of creative enthusiasm I need to feel in the studio. Another hue I love is sap green as well as titanium buff and radiant yellow, two colors with lots of titanium white. Although I feel I have settled in to a selection of colors I feel comfortable with and can easily predict color mixtures, I see no need to restrict my palette if in doing so I limit my potential. In the final analysis I just love color too much to do without such beautiful possibilities. 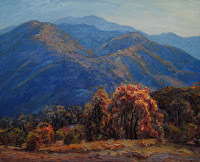 Click on the above image, View from Mountain Green, 16" x 20", oil on canvas, to see the texture.